Cleanse – with sulfate-free shampoo/cleanser or a conditioning Co-wash. I de-tangle with a wide tooth comb before final rinse. 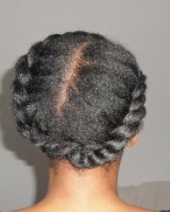 Styler then style – I use a twisting butter then proceed to twist my hair. My signature style is a flat twist updo with a twist out fringe/pompadour.